This a simple and very easy bulid Electronic Circuit Project of 8A regulator using By LMZ13608 Circuit. 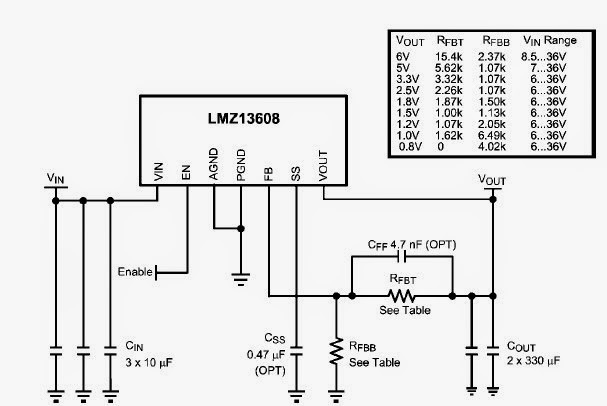 High efficiency switching power supply electronic circuit project can be designed using the LMZ13608 8A regulator . This 8A regulator electronic circuit project based on the LMZ13608 has an very high efficiency and require few external electronic parts . This power supply electronic project supports a wide input voltage range between 6 to 36 volts and will provide an fixed output voltage from 0.8 volt up to 6 volt. Some features of this power supply regulator are : fixed switching frequency (350 kHz), flexible startup sequencing using external soft-start, protection against inrush currents and faults such as input UVLO and output short circuit ,– 40°C to 125°C junction temperature range ,single exposed pad and standard pinout for easy mounting and manufacturing.